While most of my work is in London, I do regularly travel further afield, and I was particularly excited to have the opportunity to visit Silverstone recently for a portrait shoot. Mark Gallagher has worked in Formula One for 30 years and co-owns Status Grand Prix, who are based down the road from Silverstone Circuit. The shoot was for an editorial feature in Quality World magazine. We decided to start at Silverstone Circuit, and despite it being winter we were fortunate with the weather. The light from the low winter sun was perfect and allowed me to photograph Mark without the need for extra lighting. 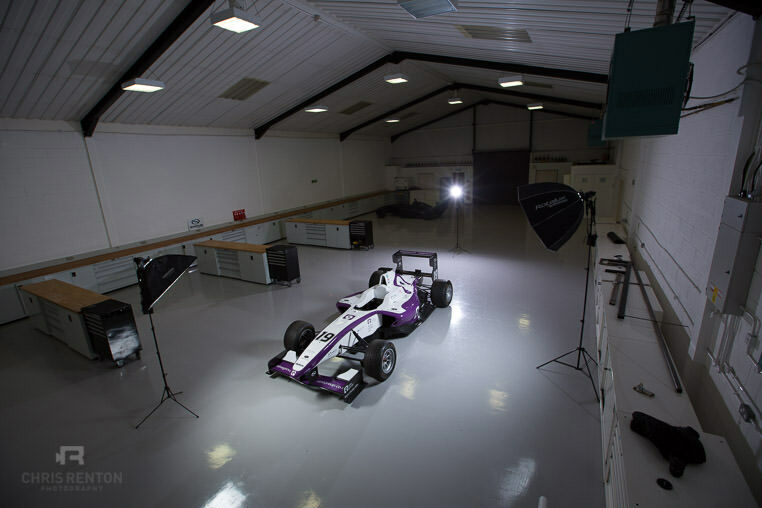 Next stop was Status Grand Prix HQ in Silverstone, where we were able to use one of the impressive Grand Prix cars. With a little help from the engineers, the car was positioned where I needed it and the lighting was put in place. For the photographers out there interested in the lighting setup, I used three Calumet Genesis GF400 portable flash units (also known as the Godox Wistro AD360 if you’re in the States), which is my go to location light for it’s power and portability. I used an Elinchrom Deep Octa softbox for my key light, and a strip softbox for some side lighting (mainly for the car), with a reflector on the third light to the rear to create some rim light. All shot on a Canon 5D Mark III with a variety of lenses. Here’s a behind the scenes photo along with a test shot of the car. And here’s how the finished portraits turned out. You can click on the following link to view more portrait photography.